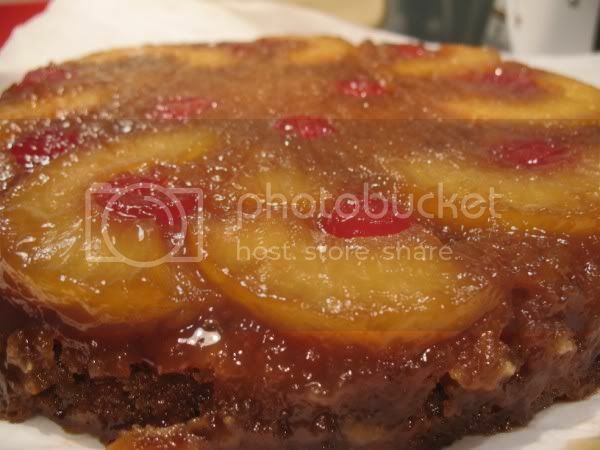 I really like pineapple upside down cake, but most of the recipes available call for cake mix and I don't know of any vegan cake mixes. It's really easy enough to make your own anyway (not to mention less expensive). Don't let the long-looking recipe fool you. It's all ready to go in the oven by the time the oven is preheated. I use coconut extract here for a creamier tropical taste. Trace a round 8-inch baking pan (with sides at least 1.5 inches high) onto a piece of parchment and cut a circle to place in the bottom of the pan. Spray with nonstick spray all over the inside of the pan. Meanwhile, drain pineapples really well and save the juice. Place rings in pan. You can use a larger can if extra rings are desired. Place maraschino cherries in and around rings in desired patterns. Pour sugar/margarine over pineapple, careful not to move them around. 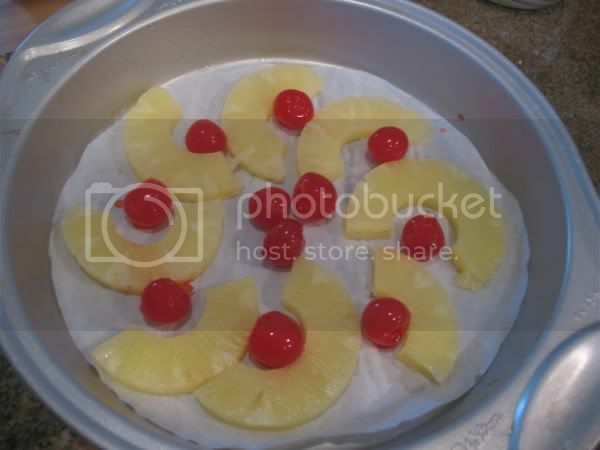 Spread sugar/margarine evenly around pineapples and cherries. Sift flour, sugar, salt, and baking soda. 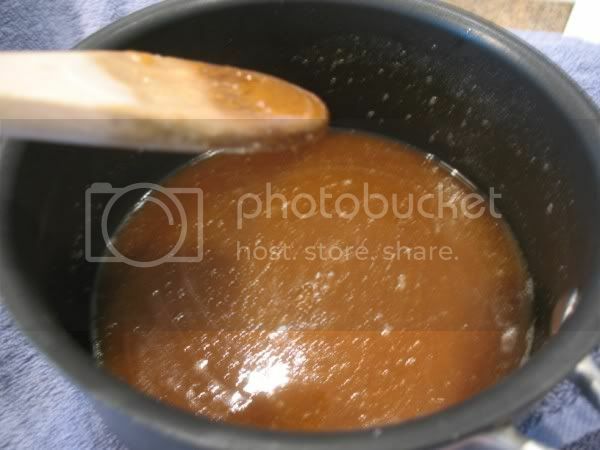 Mix in a separate bowl: vinegar, extracts, water, pineapple juice, and oil. Add wet to dry, mix well and carefully pour over pineapple/sugar in the pan. Cook for 25-40 min, checking every 5 minutes after 25. When a toothpick inserted in the cake comes out clean, it’s done. NOTE: Thank you Lori for mentioning that it took you 35-40 min. My oven was off the day I made this cake. Let cool most of the way, loosen cake from pan with a toothpick around the edges. Gently turn over onto a plate (It’s easier to put the plate upside down on the pan, and flip the whole thing together). Peel parchment off of the pineapples. NOTE: Today my oven was acting funky and I had to cook this FOREVER and if this happens to you (the sides are cooking before the center is set) then just cover the sides with aluminum and hope for the best. I ended up just baking your cake and it took more like 35-40 minutes. I haven't tasted it yet, but it is beautiful and it smells amazing. I tried this in a muffin pan so as to control my portions...it turned out beautifully and tasted awesome! Froze well, too :) Thanks! I made this today. It's absolutely divine! Thanks for a fabulous recipe! This is my fun veggie food blog. Sometimes I add money-saving tips and tips to make the dish somewhat healthier. All dishes are meat-, egg-, and dairy-free, with all the taste left intact. Thanks for stopping by! Feel free to leave a comment or link to my site. And don't forget...Be kind to animals! Soap By Tami- Yummy Vegan Handcrafted Soaps! What The Hell Does a Vegan Eat, Anyway?